Militants launched 11 attacks, using weapons banned under the Minsk agreements three times, on Ukrainian positions in the Joint Forces Operation (JFO) area in Donbas over the past day. “In particular, the enemy fired automatic grenade launchers and heavy machine guns on Ukrainian troops near Lebedynske (16km north-east of Mariupol), grenade launchers – outside Pavlopol (30 km northeast of Mariupol), 82mm mortars – outside Pisky (12km north-west of Donetsk), automatic grenade launchers and heavy machine guns – near Vodiane (16km north-west of Donetsk),” the JFO Headquarters press center reports. 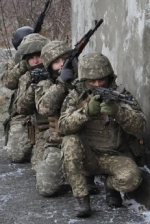 In addition, militants used grenade launchers, heavy machine guns and small arms to shell Ukrainian positions near Krymske (42km north-west of Luhansk), automatic grenade launchers – outside Vilne (70km south-west of Donetsk), grenade launchers of various systems, heavy machine guns and small arms – outside Pivdenne (40km north-east of Donetsk), 82mm mortars – outside Zhovanka (government-controlled part of Zaitseve). No casualties among Ukrainian troops were reported in last day.